- Pre heat the oven to 190°c. Dice the squash into 1cm cubes, get them on a baking tray with a generous drizzle of Olive Oil and a pinch of salt and pepper. Roast the squash for 25 mins or until soft and beginning to brown. - While the squash is roasting, add 50ml of Olive Oil to a large saucepan and on a medium/high heat fry the Coriander and Cumin seeds until they begin to pop and become fragrant. Now add the Turmeric, Garlic and Ginger and continue to cook for another minute. Add the Onion and sweat it down for about 5 mins or until it begins to brown. - Add the Split Yellow Peas/Red Lentils, followed by the Vegetable Stock and Coconut Cream, stir it all together well. Reduce the heat to a simmer and cook for about an hour, stirring regularly so it doesn't stick. If the Daal becomes too thick and stodgy whilst cooking just loosen it with a little more stock or water. - While the Daal is cooking, cover the dried Mango with boiling water and leave for 5 mins. Use a stick blender to blitz the Mango and water into a smooth paste then add it to the Daal, make sure you mix it well. 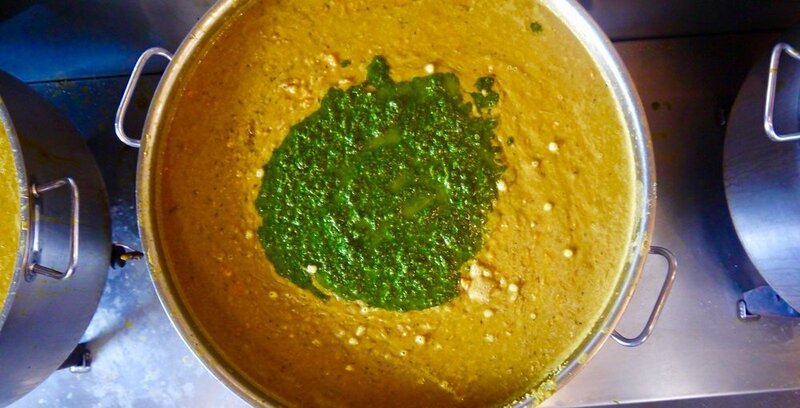 - Combine the fresh Coriander and remaining oil in a bowl and blitz until smooth. - When the pulses are soft and completely cooked through, season to taste with Salt and Pepper and finish it by stirring in the Coriander oil and roasted Squash.